Canvas by Instructure is the default platform for FAS course websites, and we're here to help you get your sites ready. Below, you can learn how to access your course websites (current and past), download quick-reference guides to key Canvas tasks, and learn where to find more training, information, and resources. If you are teaching a course in the 2018-19 academic year, your Canvas site has been created and is available for setup! You can access your site at the my.harvard course portal. Course websites from previous semesters are also available on the my.harvard portal. 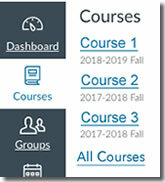 Previous Canvas sites can also be accessed at canvas.harvard.edu, by clicking the Courses link with the book icon on the blue bar on the left, and then clicking All Courses. Is your Canvas course website published? Is your Canvas course website published? If your site is unpublished, students will be unable to view it as they are deciding on their classes this semester. Even if your site is not completely ready, we recommend that you publish it so that students can view it (you can continue to work on your site after it is published). If you'd like assistance with setting up your Canvas site, or with any other aspect of integrating digital tools and methods into teaching and learning, Academic Technology for FAS is here to help. You can attend one of our Canvas workshops, digital methods seminars, or open office hours, or simply drop us a line at atg@fas.harvard.edu. Get 24x7 Live Help (online chat or phone) from the Help link inside Canvas, or visit the HUIT IThelp knowledge base for Harvard-specific information on common Canvas questions and on available support and resources. Academic Technology for FAS offers Canvas workshops and office hours at the beginning of each semester for faculty and staff supporting FAS courses. You can also get help any time by emailing us at atg@fas.harvard.edu. Did you know that you can extend Canvas with LTI applications? Whether you want your students to collaboratively annotate a text or image, access the latest content from NBC News, or write Python code in a Jupyter Notebook, there are apps are available to do this and more directly from your course website. For instructions on extending your course website, visit our Adding Apps to Canvas page.